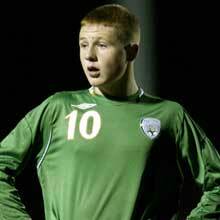 Hamilton Academicals youngster James McCarthy’s decision to represent the Republic of Ireland at international level has once again raised the debate over the international allegiance of footballers. McCarthy, 17, who was born in Glasgow but has an Irish grandfather, is the second high-profile Scottish protégé in recent times to reject the Dark Blues in favour of turning out for the Republic, after Celtic winger Aiden McGeady chose to do likewise in 2004. This has lead to harsh condemnation from some sections of the public, and McCarthy has even been subjected to sectarian abuse at some grounds around Scotland. But given the SFA’s record of capping players born outside Scotland, could this not be viewed as hypocritical? Throughout the 1990’s Scotland capped numerous foreign-born players, including Andy Goram, Don Hutchison, and Richard Gough, who were born in Bury, Gateshead and Stockholm, respectively. The current Scotland squad includes several English-born players, the most notable of whom is West Bromich Albion star James Morrison, who currently plies his trade in the English Premiership. What the reaction to McCarthy’s decision has also shown is how widespread a problem sectarianism is in Scottish football. Traditionally viewed as a problem largely confined to Glasgow’s ‘Old Firm’ clubs, Rangers and Celtic, it has recently shown to be more common than people assumed. It has been claimed that McCarthy has been forced to endure sectarian taunts at every stadium Hamilton has played at since announcing his decision, including St. Mirren Park in Paisley and Motherwell F.C’s Fir Park ground. So as the debate rumbles on, it looks increasingly unlikely that Scottish football will be able to ‘Show Racism the Red Card’ and wash their hands of the issue that has blighted the Scottish game for so long. Posted in Sports and tagged Hamilton Accies, James McCarthy, Old Firm, Sectarianism. Bookmark the permalink.